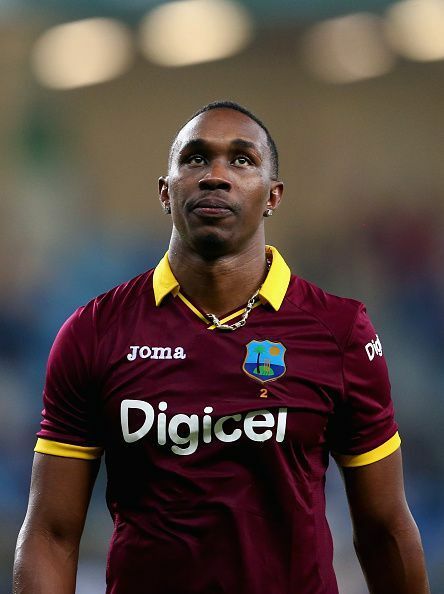 Dwayne Bravo is a West Indies cricketer, and one of the best all-rounders in the T20 format of the game. He was born on 7th October 1983 at Santa Cruz, Trinidad and Tobago. The all-rounder is a right-handed batsman and right-handed medium-fast bowler. Bravo’s trademark juicy full-toss dips in sharply in the last moment like a football free-kick and knocks over the stumps. At the age of 10, Bravo was selected in the Queen’s Park Cricket Club Under-15 side and started bowling at 17. As an opener; Bravo had a lean 2002 ICC U-19 World Cup. Bravo scored 31 runs in two innings in his first-class debut for Trinidad and Tobago against Barbados in Busta Cup in February 2002. He toured with West Indies A side in England in 2002. His prolific 2003 season, especially a ton and 6 for 11 against Windwards islands brought him closer to the national team. Bravo picked two wickets in his ODI debut against England at Georgetown in April 2004. In his third match, a brisk 12 runs in 6 balls helped West Indies to seal the match. Three months later, he took three wickets scoring 44 and 10 in the two innings in his international test debut against England at Lord’s. He displayed grit scoring 77 runs and scalping six wickets for 55 in the fourth test in Manchester. In his T20I debut, Bravo evinced his all-round skill taking two wickets and scoring 19 runs off 16 balls in a tied game against New Zealand in Auckland in February 2006. Bravo amassed 213 runs in two tests against Australia including a patient 113 in Hobart and 6 for 86 in Adelaide in November 2005. In May 2006, Bravo steered West Indies to victory against India with unbeaten 61 and taking three wickets in the fourth ODI along with holding his nerve to pick Yuvraj Singh at a crucial time in the second ODI. He scored 154 runs at 38.50 taking 10 wickets at 18.40 in 2009 ICC World T20. Bravo’s four wickets and 66 runs off 36 balls won the match against India at Lord’s. Bravo became the first bowler to take 400 T20 wickets. Due to injury and preference to T-20 leagues, Bravo played only 40 tests out of 81 tests of West Indies till 2013. He played last test in December 2010 ultimately retiring in January 2015 from the tests. Bravo pulled out from India tour due to a dispute over payment structure with West Indies board in after the fourth ODI in October 2014 which was his last ODI. Bravo captained West Indies in one test and led in seven ODI’s before permanently taking the charge in February 2013. Bravo won 16 ODIs in 36 games. Bravo also led West Indies in six T20I, winning three. Bravo domestically represented Trinidad and Tobago and played for Trinbago Knight Riders in Caribbean Premier League. He represented Mumbai Indians, Chennai Super Kings and Gujrat Lions in the Indian Premier League, winning the 2013 Purple Cap with 32 wickets. He was picked up by CSK at Rs. 6.40 crore using Right to Match card in the 2018 IPL auction. He plays for Melbourne Renegades, Sydney Sixers in Big Bash League, Chittagong Kings in Bangladesh Premier League and Dolphins in South Africa. Recently, he played for Maratha Arabians in T10 league in 2017.